Days before the start of the people-led initiative Peoples’ Global Conference (PGC) Against International Monetary Fund-World Bank (IMF-WB), the Indonesian government ordered a Bali-wide ban on all forms of public assembly and gatherings, in a desperate attempt to stifle the voices of progressive groups, civil society organizations and people’s movement. On Wednesday afternoon, after the Bali Intelligence Police denied issuance of permit to the PGC, the administration of Radio Republik Indonesia (RRI) Auditorium, sent a sudden advisory disallowing the use of venue due to “urgent renovations.” The RRI auditorium is the published venue of the PGC from October 11 to 14. “The government and authorities’ hands on this cannot be denied. The IMF-WB Annual Meetings in Bali will be this year’s biggest world economic event. It will gather the top leaders of different states and global leaders of financial institutions responsible in controlling government policies and corporatizing development programs that have devastating impacts on peoples and communities. There is no better opportunity to register the people’s resistance than here and now,” said Rahmat, Chairperson of Aliansi Gerakan Reforma Agraria (AGRA) and Secretary General of Asian Peasant Coalition (APC). According to reports, the Indonesian government is spending more than USD 59 million in preparations, infrastructure, security and renovations to accommodate the Annual Meetings. Peoples organizations have criticized the state’s grandeur and lavish preparations amidst recent calamities in Lombok, estimate damage cost now more than USD 300 million, and tsunami in Palu City, with current death toll of more than 1,400 with over 3,000 building damaged or destroyed. “Road closures and odd-even coding to vehicles have already shrunk people’s mobility, and the enormous number of state forces is definitely an overkill,” said Rahmat. As of today, an estimated 22,000 police and military forces is set to be deployed in Bali for so-called “anti-terrorist and anti-criminality operations” raising concerns to human rights lawyers for widespread risks of criminalization, harassment and intimidation. “Even the IMF-WB has provided a token space and schedule for rallies within the Annual Meetings, yet the Indonesian government chose to play the IMF-WB’s ravaging lapdog doing its best to silence critics and dissenters. The Indonesian authorities seem ready to do everything – even violating the people’s core democratic rights to peaceful assembly and freedom of expression,” Hendrik Rosdinar, YAPPIKA-Actionaid. The PGC is expected to gather almost 50 international and national mass organizations, people’s groups, civil society organizations, community leaders, and representatives from the peasant, workers, youth, women and indigenous peoples’ sector. 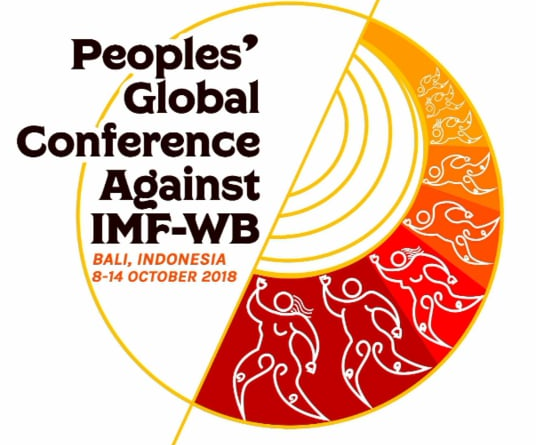 The 4-day peoples conference is set to tackle the effect IMF-WB’s aggressive push for transnational corporations to profit from the underdevelopment of the global South, and to forge international unity in coming up with ways to strengthen the capacities to resist the corporatization of development.